The Long Now’s Long Bets project asks us, active bettors and wider public alike, to think more deeply and carefully about the medium- to long-term future than our assumptions (and busy schedules) might otherwise allow. [I]n having children—in engendering them, in loving them, in teaching them to love and care about the world—parents are betting, whether they know it or not, on the Clock of the Long Now. They are betting on their children, and their children after them, and theirs beyond them, all the way down the line from now to 12,006. 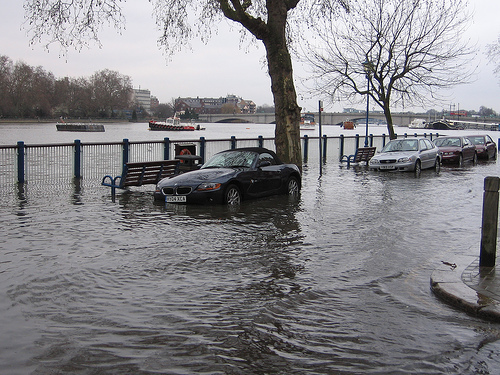 Investors have been given their first opportunity to bet against the possibility of a disastrous flood crippling business in the City and Canary Wharf, with the sale of the world’s first “flood” bond on capital markets. The new $150m bond has been issued by an arm of Allianz, the German insurer, to protect itself from devastating claims that might arise from companies affected by such a flood. In recent years, insurance companies have turned increasingly to the capital markets to spread their vulnerabity [sic] to catastrophes, and have already issued bonds whose value is linked to US hurricanes or earthquakes. However, it has until now been impossible to create flood bonds, because most countries lack precise systems to measure damage. The inaugural issue is worth $150m, but Allianz has in place a programme to issue up to $1bn in the future. The report describes an interesting trend, of insurers spreading the financial risk associated with natural disasters to the capital markets (in the event of hurricanes, earthquakes, and now floods). A space to watch, in light of increasing concern over extreme weather events caused by climate change. But aside from underlying reasons for the shift (greater volatility? ), the key point here is the enabling mechanism — increasing availability of ways to measure increments of disaster. What can be measured can be bet on. Those who follow Long Bets will know that adjudicability of bets is one of the key questions for long bettors. Rhetorically grand, but forensically fuzzy, claims are Long Bets’ bête noire. They run into the bar of adjudicability (and hence accountability) deliberately raised by the project. What we see here is that risks which can be specified and measured with sufficient precision become subject to the gaming of financiers. And it seems that, if and as technologies for quantifying natural processes improve and become more widespread, the pool of events we can rigorously bet on, in the world of finance or otherwise, will continue to grow. Perhaps not just large-scale natural events, but other things (internal bodily processes? social dynamics of organisations or countries?) could become quantifiable, hence “bettable” — a site of unprecedented accountability. What might this mean in the long run for how risk is managed in society?